Christopher Jonathan James Nolan (born Julie 30, 1970) is a Breetish-American movie director, writer an producer. He eften works wi his brither, author Jonathan Nolan. 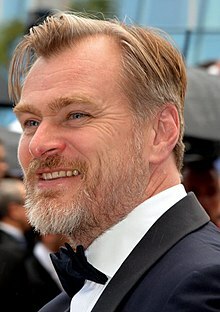 Nolan is best kent for directin the psychological thriller Memento, an for reviving the Batman movie franchise as the director of The Dark Knight Trilogy. Ilk o them are Batman Begins (2005), The Dark Knight (2008), an The Dark Knight Rises (2012). He is an aa the founder o the production company, Syncopy Films. Nolan is colour blind tae the colours o green an reid. Wikimedia Commons haes media relatit tae Christopher Nolan. NolanFans.com Fansite and community for Christopher Nolan. This page wis last eeditit on 27 Februar 2019, at 22:29.